Caption The Autumn Moon Festival also known as the Mid-Autumn Festival is a popular celebration of abundance and togetherness dating back to China’s Song Dynasty over 1000 years ago. 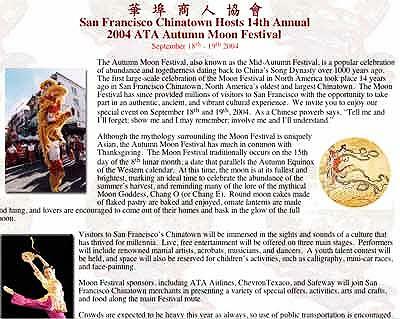 The first large-scale celebration of the Moon Festival in North America took place 14 years ago in San Francisco Chinatown North America’s oldest and largest Chinatown. The Moon Festival has since provided millions of visitors to San Francisco with the opportunity to take part in an authentic ancient and vibrant cultural experience. We invite you to enjoy our special event on September 18th and 19th 2004. As a Chinese proverb says “Tell me and I’ll forget; show me and I may remember; involve me and I’ll understand.” Although the mythology surrounding the Moon Festival is uniquely Asian the Autumn Moon Festival has much in common with Thanksgiving. The Moon Festival traditionally occurs on the 15th day of the 8th lunar month a date that parallels the Autumn Equinox of the Western calendar. At this time the moon is at its fullest and brightest marking an ideal time to celebrate the abundance of the summer’s harvest and reminding many of the lore of the mythical Moon Goddess Chang O or Chang E. Round moon cakes made of flaked pastry are baked and enjoyed ornate lanterns are made and hung and lovers are encouraged to come out of their homes and bask in the glow of the full moon. Headline SEP: Chinatown Autumn Moon Festival.